by Dr Janina Scarlet is out now and priced at £9.99. Good books allow us to escape from our own reality and to make strong emotional connections with fictional characters. The power of this escapism and empathy is something championed by clinical psychologist Dr Janina Scarlet. In her ground-breaking new book, Dr Janina Scarlet takes a unique approach to self-help. Therapy Quest is an interactive fantasy adventure novel that immerses the reader in a fantasy world where they are at the centre of the story. Dr Janina Scarlet is a Licensed Clinical Psychologist who works to help treat mental illnesses through Superhero Therapy. This unique form takes evidence-based therapies and integrates characters from geek culture, including fantasy, science action, video games and comic books. After surviving Chernobyl radiation and anti-Semitic persecution in Ukraine, Janina moved to the United States as a refugee at age 12. It was there that she fell in love with superheroes, they have also survived radiation and used their abilities to help others – they weren’t victims, but survivors. Janina has dedicated her life to helping others, she has written multiple self-help books, spoken at conferences and regularly works with patients suffering from anxiety, depression and PTSD. For people who are reluctant to go to therapy, or are sceptical about self-help books, Therapy Quest offers a different option. It offers a form of escapism, transporting the reader out of their room into the land of ‘Here’. The adventure brings new friends who are each going through their own struggles as you quest together to learn how to cope with difficult experiences, from a Minotaur’s struggle to come to terms with his wife’s terminal illness – to a Vampire with an eating disorder. Together you must support each other, and challenge your own inner demons if you have any hope of challenging the sorceress Mallena. 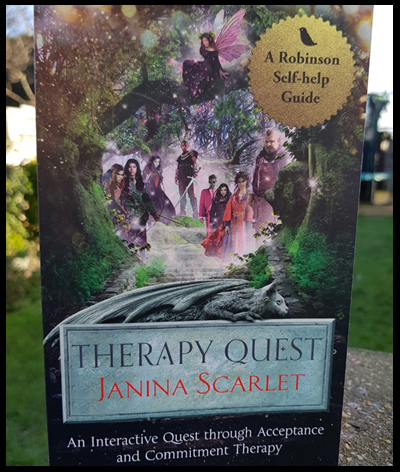 Therapy Quest is unlike any fantasy novel or self-help book you have read before, it will challenge you – but at the end, this fantasy will have taken you on a very real journey. I loved this book! I read it as part of my Miracle Morning, and couldn't wait to get up each morning to read the next chapter/decision. As you reach a crucial part in the book, you are given a choice, one of which will either see you lose or receive zero points or worse, your journey ends and you need to go back to the start or at a previous point in the book and choose the other option. I got through the book with enough points to fight the final battle, but once completed, I then went back and chose the other options to each of the decision points and it is here where the book really comes into its own. With each decision that sees the story end or loses points, there is guidance and help on how to tackle your inner demons. There is a section where you become a werewolf, and the main point here is that being a werewolf is just a part of who you are, you don't allow this to define you. Reminds me of a scene out of one of my favourite movies StarDust where he announces he's a shop boy, and Yvaine says "There are shop boys, and there are boys who just happen to work in a shop for the time being". The werewolf quote will forever stay with me.